Michael Behar broke an important story this week, though you've probably never heard of him. He's the guy who first wrote about Camp Solomon Shechter flying a Palestinian flag. But you'd never know it from reading the coverage of that story. Because not a single one of the news outlets that subsequently ran the story thought to credit him. Not the JTA nor any of the various news outlets that subscribe to this resource, for instance, Fox, Tablet, and Israel International News. Not that Michael cares. What he cares about, is Israel. That is at the heart and soul of all the work he does. That story was a shocker. The camp did its best to clean up the mess it made after the fact, but its apology ran far short of even a modicum of sincerity. 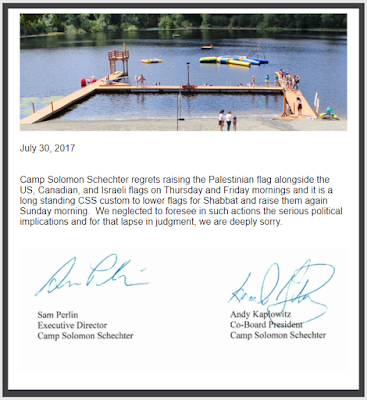 The administrators of the camp seemed only to be sorry about the fact that things got "political." As if it were not "political" for a Jewish camp to fly the flag of a wannabe state that would be founded on the principle that Israel cease to exist. Now Mike and I have been friends for five years. He has shared every single piece I've ever written during that time (and that's a considerable number of pieces). We also collaborated on articles here and there. No one has been as staunch a supporter of my views as Michael Behar. So naturally, I was going to share his shocker of a story. But I was going to share it even if I didn't know Michael from a hole in the wall. Because it was a huge story. And being that it was, in fact, coming from Michael, I knew it was a TRUE story, to boot. He's the most honest guy I know. Like I said, Michael cares about Israel. So much so that during the last war with Gaza, Mike and his wife had siren apps on their phones so their kids would know what Israel was going through, and empathize. Michael's blogs are all about fighting the good fight for the land he loves most of all. "Please do not share anything from the Mike Report. He brings shame to Israel and the Jewish people through his lies, propaganda and hatred. He targets other Jews and fosters baseless hatred in our community. Sharing his words reflects poorly. 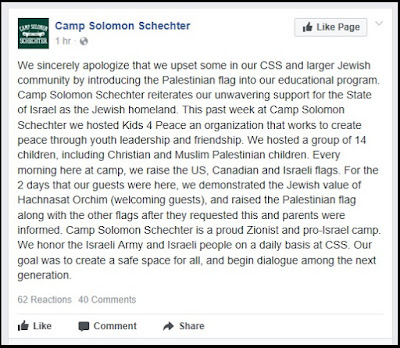 Please delete what you shared, especially what he wrote about Camp Solomon Schechter. You do not want to be a part of spreading such negativity and animosity towards fellow Jews. Ahavat Yisrael: let us foster love and not hate." This to me, was worse than what the journalists did by not crediting Michael for breaking the story. Kinberg was saying terrible things about Michael, horrible things, things that seemed the complete opposite of what I knew to be true. This, during the nine days leading up to Tisha B'Av, a time when observant Jews attempt to rectify the sin that led to the destruction of the Temple, that of baseless hatred. Moreover, Michael's piece was honest. The camp did, in fact, fly the Ashaf (PLO) flag. Note that the PLO's charter calls for the destruction of the Jewish state. Not to mention continued terror against Jews. Which they call "resistance." Why did Kinberg want to suppress Michael's blog piece? Why was she smearing him, a hateful act, and accusing him of "baseless hatred?" How does it foster love to fly the flag of a people determined to annihilate us? 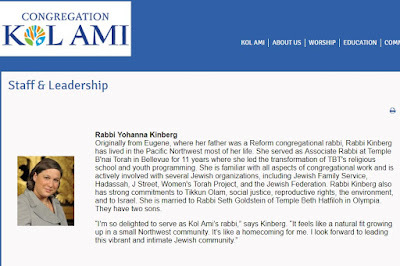 It sure did seem like the animosity was all hers: all Rabbi Kinberg's. 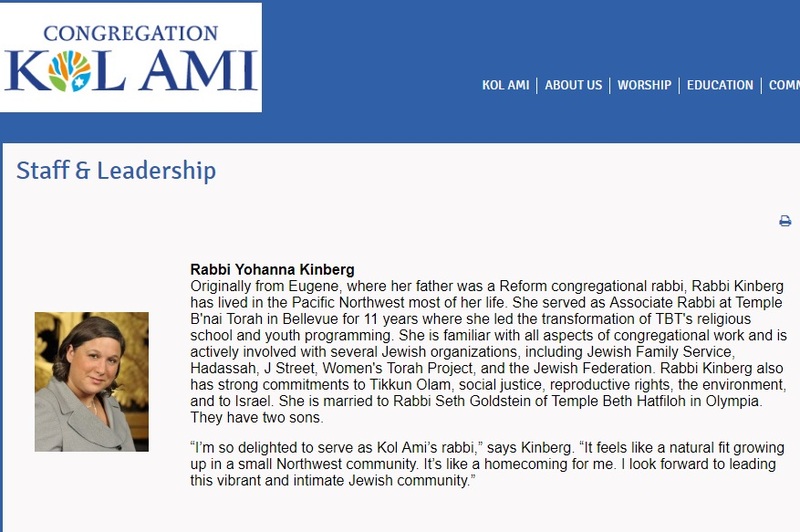 "Look, my blog focuses on the intersection of Israel and the Pacific Northwest so naturally as a local public figure, Rabbi Kinberg’s anti-Israel activism from my perspective is newsworthy. I’ve been told that Rabbi Kinberg has been on some sort of angry personal crusade against me, that’s okay—I see it as a symptom of the frustration she and her cohort feel over not having a monopoly on the narrative. I don’t take it seriously; she pretty much just lashes out online in the same way President Trump does when the press doesn’t frame a story to his liking. "I am amused by her serial contradictions. Let me give you a few examples. She asserts that it is noble and brave to publicly vilify the Jewish state, but divisive and cowardly for bloggers to report that she has publicly vilified the Jewish state. She railed against a local synagogue for screening a film critical of J-Street, saying it was divisive, and then joined a public rally against AIPAC. She marches with the rabidly anti-Israel group IfNotNow and then excoriates anybody who dares to question her pro-Israel bona fides." I was beginning to understand. "But," I wondered aloud, "Doesn't it bother you, her going behind your back and saying such awful things about you?" "Nope. Aside from when I am reporting on her anti-Israel activities, I give her not a moment’s thought." "Wow," I said. "I couldn't do that. I would be up all night tossing and turning." "Well, I bear no animosity towards Rabbi Kinberg, I believe she is in many cases wrong, but she is entitled to her opinion. "She seems to sincerely believe that she can march in an anti-Israel rally and that nobody is allowed to report on it unless it includes praise for her resilience, virtue and bravery. 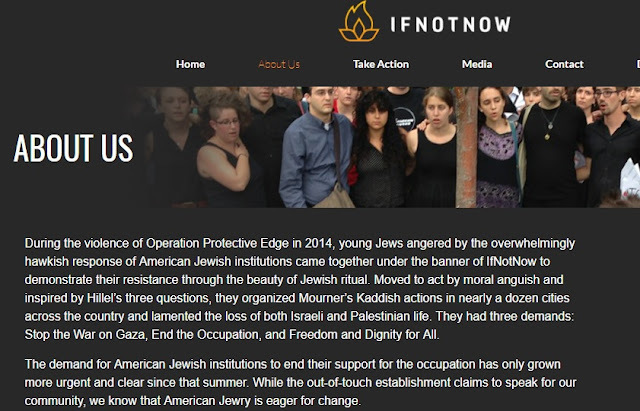 Her idea of Israel advocacy is marching with IfNotNow, a radical group that is agnostic on whether or not a Jewish state should even exist. She seems to be upset that I identified the anti-Israel march in which she participated. She libels as haters those who love Israel and long for peace. "If she wishes to foment hate towards her fellow Jews that is her right, but it doesn't reflect well on her or her congregation." "No it certainly doesn't," I said. "Especially so close to Tisha B'Av." "Exactly," said Michael, "At a time when we need to have difficult conversations with those with whom we disagree Rabbi Kinberg is doing real damage to our community. She simply labels good people as haters and tries to shut them down. "Baseless hatred brought destruction to our people. 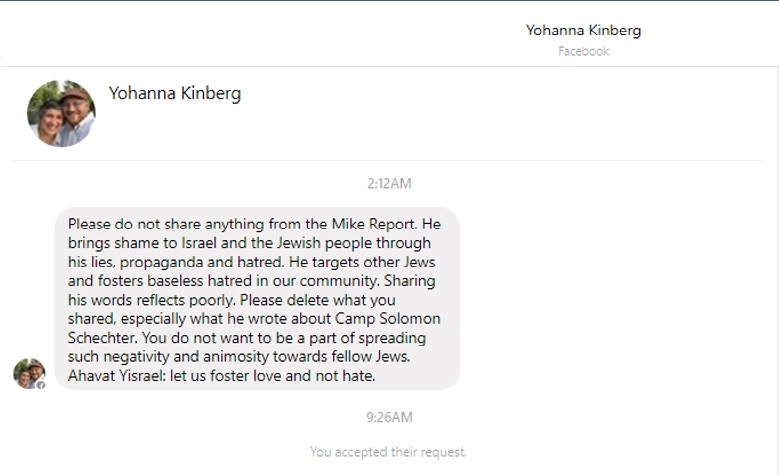 My prayer is that Rabbi Kinberg will open her heart to her fellow Jews, even Israel lovers. She cannot seem to fathom that those with whom she disagrees may be good people who long for peace as much, if not more so than her." "Okay," I said. "But to simply shut people down, to try to suppress opposite viewpoints??" "Shutting down the conversation is exactly the wrong approach, we need to be able to listen to one another," said Michael. "She has a history of trying to shut down different perspectives. She tried to stop a pro-Israel film from being screened in Seattle and seems to think supporting Israel is hate speech. To her, those who disagree are not just wrong, they are expressing anti-Jewish values. Of course, she gets to decide what Jewish values are." All that day and during the long Tisha B'Av fast, I tried to make sense of it: Michael telling the truth, Rabbi Kinberg attempting to suppress his piece and calling it hate. Should it not be somewhat shocking to be approached during the Nine Days by a rabbi spreading rechilut (defamation) and lashon hara (harmful gossip)? This, in fact, was why the temple was destroyed. In Rabbi Kinberg's words, I saw nothing of peace, understanding, or love. I saw one Jew denigrating and demonizing a fellow Jew, someone I knew to be a lover of peace and a lover of Israel.